The Patriot | Standard Figurines | One Price Low Flat Shipping! From Westland Giftware's Horse of a Different Color Fall 2015 Collection, The Patriot Clydesdale figurine. Made of hand-painted resin. Measures 6.5" tall. A metal plaque is embedded in the base, showing the title and the exact serial number (out of 10,000). 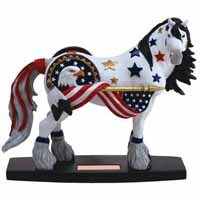 This patriotic clydesdale is painted bright white and boasts America's red and blue colors in the stars along with a depiction of the eagle on the Great Seal of the United States along with a furled American flag.